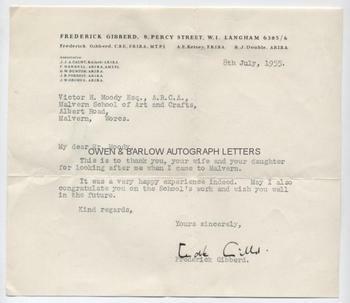 SIR FREDERICK GIBBERD Typed Letter Signed. British (English) Architect and Town Planner. TLS. 1p. 8 Percy Street, W1. 8th July 1955. To Victor H[ume] Moody. "This is to thank you, your wife and your daughter for looking after me when I came to Malvern. It was a very happy experience indeed. May I also congratulate you on the School's work and wish you well in the future." 4to. Approx 7 x 8 inches. Fine. Sir Frederick Gibberd was one of the most influential of 20th century British architects. He designed what was probably Britain's first modern style high-rise housing block and the first modern indoor shopping mall. He is best known, however, for Liverpool's Catholic Cathedral, the Central London Mosque and Heathrow Airport. His most important work was as a pioneering town planner, which included the design of Harlow New Town. Victor Hume Moody was an artist and the principal of Malvern School of Art and this Letter is from the studio archive of Moody and his daughter, Catherine. Gibberd's autograph is quite an uncommon one amongst 20th century British autographs.